Our research is at the crossing point between statistical physics, hydrodynamics and biology. We are currently assessing the swimming properties of various motile bacteria exploring individually or more collectively, different environments. We vary the chemical and rheological properties of the suspending fluid and we seek to determine the emergent transport properties of the suspension. We currently use different types of bacteria such as wild-type/mutant E.coli or magnetotactic strains, sensitive to a magnetic field. To this purpose, we developed in the lab different original tools such as an automatic Lagrangian tracking device suited to follow in 3D, fluorescent motile bacteria and eventually visualize their flagellar dynamics in various microfluidic channels. We are also using a nano-printing device to build complex mechanical parts interacting with the bacteria and possibly using their swimming energy as an energy source. We are also using soft-lithography microfluidic tools in order to design and create micro-channels representing different levels of geometrical complexity in order to study the transport processes in the active suspension. 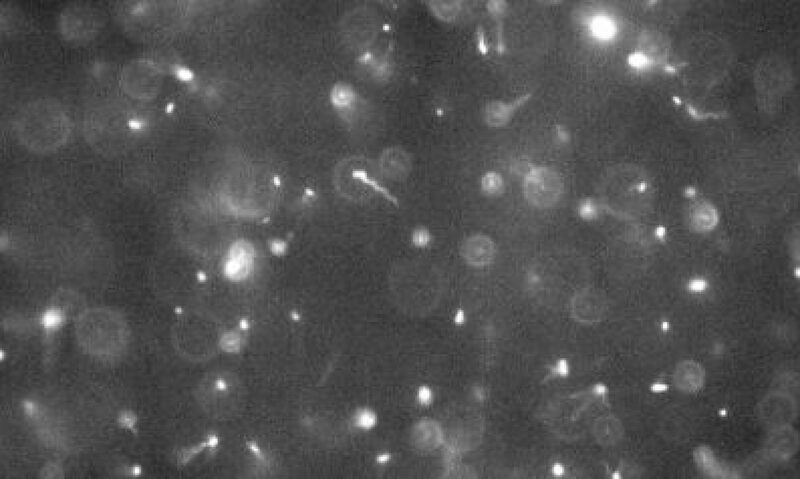 A central question is to understand how the active part stemming from the motility and collective swimming effects are likely to change many of the macroscopic constitutive relations. These studies are in relation with a new conceptual vision of statistical physics on active matter as the individual motility brings new organization principles and leads to original out-of-equilibrium phases. We are currently trying to revisit many of the classical concepts of macroscopic physics (constitutive relations, transport properties) and suspension hydrodynamics. Actuated rheology of magnetic micro-swimmers suspensions: Emergence of motor and brake states, B.Vincenti, C. Douarche and E. Clement, Phys. Rev. Fluids 3,033302 (2018). E coli Accumulation behind an Obstacle, G. L. Miño, M. Baabour, R.Chertcoff, G. Gutkind, E. Clément, H. Auradou, I. Ippolito, , Adv. Microbiology, 8, 451-464 (2018). Viscosité d’une suspension de bactéries : des efforts individuels aux efforts collectifs, H. Auradou, C. Douarche, A. Creppy, H.-M. Lopez et É. Clément, Reflets phys. 57, 20-23 (2018). Lagrangian 3D tracking of fluorescent microscopic objects under flow, Review of Scientific Instruments,Darnige, N. Figueroa-Morales, P. Bohec, A. Lindner and E. Clément, 88, 055106 (2017). Active dry granular flows: Rheology and rigidity transitions, A.Peshkov, Ph.Claudin, E. Clément, B. Andreotti, Europhys. Lett, 116, 14001 (2016). Bacterial suspensions under flow, E. Clement, A. Lindner, C. Douarche, H. Auradou, Eur.Phys.J. Special Topics, 225, 2389 (2016). Turning bacterial suspensions into a « superfluid H.M. Lopez, J. Gachelin, C. Douarche, H.Auradou, E. Clément, Phys. Rev. Lett. 115, 028301 (2015). Living on the edge: transfer and traffic of E. coli in a confined flow, N. Figueroa-Morales, G. Miño, A. Rivera, R.Caballero, E. Clément, E. Altshuler, A. Lindner, Soft Matter 11, 6284 (2015). Collective motion in E. coli bacteria suspensions, J.Gachelin, A.Rousselet, A.Lindner, E.Clement, New Journal of Physics, 16, 025003 (2014). Flow-controlled densification and anomalous dispersion of E. coli through a constriction, E.Altshuler, G.Mino, C. Perez-Penichet, L.del Rio, A.Lindner, A.Rousselet, E.Clement, Soft-Matter, 9 , 1864 (2013). Non-Newtonian active viscosity of E-coli suspensionsJ.Gachelin, G.Mino, H. Berthet, A.Lindner, A.Rousselet, E. Clement, Phys. Rev. Lett. 110, 268103 (2013). A two sphere model for bacteria swimming near solid surface, J.Dunstan, G.Mino, E.Clément, R.Soto, Phys. of Fluids 24, 011901 (2012). Enhanced diffusion due to active swimmers at a solid surface, Miño, T. E. Mallouk,.T. Darnige, M. Hoyos, J. Dauchet, J. Dubstan, R.Soto, Y.Wang, A. Rousselet, E. Clément, Phys.Rev.Lett. 106, 048102 (2011).